The Hamburg Uprising (German: Hamburger Aufstand) was an insurrection during the Weimar Republic in Germany. It was started on 23 October 1923 by one of the most militant sections of the Hamburg district Communist Party (KPD), the KP Wasserkante. Rebels stormed 24 police stations, 17 in Hamburg and seven in Schleswig-Holstein Province in Prussia. From a military point of view, the attempt was futile and over within three days. Without support from the rest of Germany and the Soviet Union, the communist insurgency disintegrated. Some 100 people died during the uprising. The exact details of the rebellion, as well as the assessment of its impact, are controversial to this day. Between 1919 and 1923, the Weimar Republic was in crisis and there were many violent conflicts between left- and right-wing elements. The economic situation of the population was rapidly deteriorating and by autumn 1923 hyperinflation was at its peak, which brought gains in popularity to the Communist Party. The Occupation of the Ruhr region further radicalized the political disputes. In August 1923, there was a wave of nationwide strikes against Reichskanzler Wilhelm Cuno. At the end of September, the government declared a state of emergency. On 1 October, the Black Reichswehr attempted the Küstrin Putsch. Two weeks later, on 13 October, the Reichstag adopted an enabling act that was to facilitate a de jure dictatorship by Chancellor Gustav Stresemann. A demonstration of several thousand unemployed stormed the "forbidden zone" around the city hall,[where?] an action which, during this period, risked death at the hands of the police and right-wing paramilitaries. In Saxony and Thuringia, coalition governments were formed that included the KPD, which saw this as an opportunity to take over. Within the international Communist movement, there was discussion of an attempted armed rebellion in Germany. Leon Trotsky and other influential members of the Soviet Politburo and the Comintern advanced the idea, but Heinrich Brandler, head of the KPD, felt it was premature. The exact motives of the small Hamburg group led by Hugo Urbahns and Hans Kippenberger, who planned the uprising, remain unknown. Late on 22 October 1923, the military leader of the KP Wasserkante received orders via the regional party leadership to begin the rebellion. 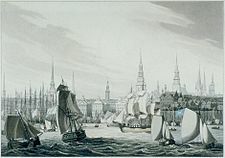 Only 1,300 took an active part in the rebellion from the beginning, although the Hamburg KPD numbered some 14,000 members. No more than 5,000 workers had participated by the end of it. On 23 October at 5:00 a.m., they stormed 26 police precincts and took weapons from 17 of them. There was also activity in Altona and the urban district of Stormarn, where the police stations in Schiffbek and Bramfeld were attacked and weapons taken. In Bad Oldesloe, Ahrensburg and Rahlstedt, train tracks and streets were blockaded. In the town of Bargteheide, insurgents arrested local government leaders and proclaimed the "Soviet Republic of Stormarn". In Schiffbek, where the KPD had support, placards were posted to calm residents and to urge support for the uprising, declaring "Long live Soviet Germany! Long live the Federation of Soviet states of the world! Long live the world revolution!" Most of the uprising was quelled in a few hours. In Schiffbek, it lasted till just past noon. Only in Barmbek, where the KPD had received some 20% of the vote in the previous election, the insurgents were supported by residents, who helped them build barricades and brought them food. The rebels were able to maintain their position during the entire day, despite the continuous exchange of gunfire. At night, however, convinced of the hopelessness of their situation, they sneaked away. The next day, the police launched a major offensive against empty barricades. The Uprising claimed the lives of 17 police officers, 21 rebels and 61 innocent bystanders. Sixty-nine police officers were wounded, along with 175 rebels. There were 1,400 people arrested, with 443 tried in a special court. In Schiffbek alone, 191 people were arrested and later, in February 1925, had to be tried at the Altona Landgericht because of unrest in Schiffbeck, where the KPD had garnered 32.4% of the vote in the May 1924 election. This was the largest of the trials against the Uprising insurgents. The Uprising contributed to the deteriorating relationship between the two working class political parties. After the Uprising, the Social Democratic Party of Germany (SPD) refused to work with the KPD and even intensified the repression of the KPD by reinforcing the government's positions. Rejection by both the Republic and the SPD strengthened the Communists. Within the KPD, the Uprising became a heroic legend about the "courageous" few rebels facing a hopeless fight. The defeat of the Uprising was interpreted as the consequence of too little centralization and too little obedience to party-oriented structures and evidence that these must be increased. 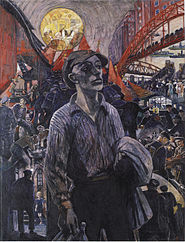 Sections of the middle class saw in the Uprising their fears of a Bolshevik Revolution confirmed and became more attracted to anti-communist politics. As a result, in the 1924 Hamburg Reichstag election, the German National People's Party saw their share of the votes rise from 12% to about 20%, though it quickly dropped back to around 12% in 1928. ^ Lemmons 2013, p. 35. ^ a b c d Lemmons 2013, p. 36. Lemmons, Russel (2013). Hitler's Rival: Ernst Thälmann in Myth and Memory. Lexington, Kentucky: The University Press of Kentucky. ISBN 978-0-8131-4090-2. This page was last edited on 7 January 2019, at 15:55 (UTC).